Low cover concrete repair coatings provide a solution for reinstating effective cover on precast and in-situ reinforced concrete avoiding costly major repair work. The depth and quality of concrete on bridges and other concrete covered structures is vital to protect its encased reinforced steel. Lack of protection to the re-bars can lead to premature de-passivation of the steel and subsequent corrosion. Inadequate concrete cover will not only speed up the damaging effects of carbonation but also allow even more rapid ingress of chlorides, moisture and oxygen which could have a fatal effect on the structure. If low cover is identified, remedial measures could include drastic and costly measures of demolishing sections that fail to meet the required specifications, or partial recasting with new concrete. CSC Services can however offer a more practical and cost-effective means of reinstating cover through protective coating. CSC Services have many years of experience installing cementitious coatings to reinstate concrete cover. There are a range of different coating products available depending upon substrate compatibility, life span and the film thickness required to provide the necessary cover. CSC Services work closely with a range of product manufacturers to be able to offer the best solutions for clients. CSC Services will often specify a waterborne, cementitious modified polymer coating. A 2mm coating is equivalent to 100mm of good quality concrete cover, and provides a complete barrier to water under 10 bar pressure. Being cement based, it chemically reacts with the substrate to form an integral part and will have a design life equivalent to that of the concrete to which it is applied. Not only does this high performance cementitious coating reinstate cover it provides structures with additional protection against freeze/thaw cycles, de-icing salts, water and chloride ion penetration, thus ensuring that the life span of the structure is both achieved and extended. All of CSC Services’ operatives undertake regular training on the Repair and Protection of Reinforced Concrete Structures in Accordance with BSEN1504 which is approved by the Institute of Concrete Technology. CSC Services are members of the Concrete Repair Association. CSC Services provide refurbishment services and protective coatings to structures across the UK water sector, in nuclear power stations, public sector buildings such as hospitals and prison buildings, and across UK infrastructure including bridges, tunnels, culverts and sewers. Call us on 0191 410 3444 today for more information about low cover concrete repair coatings . In 2017 CSC Services refurbished and reinstated a sewer pumping station wet well for Anglian Water using Low Cover Concrete Repair Coatings. The structure had suffered from hydrogen sulphide corrosion to the internal concrete surfaces. 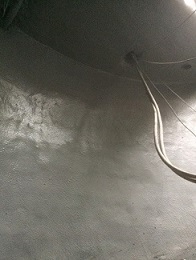 Following the application of a high strength structural repair mortar, a high performance cementitious coating system was installed. 2mm of this coating system is the equivalent to 100mm of good quality cover. It provides a hard, durable coating with excellent resistance to water, hydrogen sulphide, oxygen and aggressive chemicals. This will significantly extend the life-span of the structure.